Shazam! director David F. Sandberg has shared a hilarious mashup of his upcoming movie and Disney's Dumbo live-action remake. Sandberg is clearly having a lot of fun promoting the movie on social media and has posted some pretty good images and video lately. Aside from the mashup, the director posted a picture of a Shazam! bus and threw shade at the Batmobile in the process. Adding to the positivity is the early praise that the movie has received, which has also been shared by Sandberg. In a Shazam! TV spot released earlier this week, we see our hero trying to fly after learning that belief is "six tenths" of having super powers. 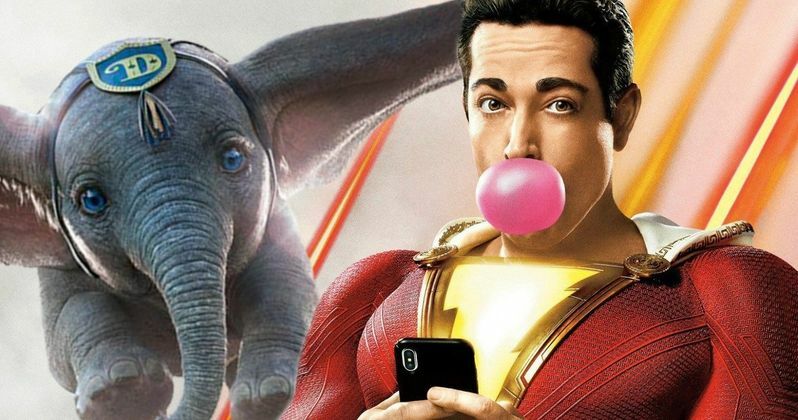 One clever fan took the footage and spliced it in with Tim Burton's upcoming live-action Dumbo movie and the results are pretty funny as Shazam is called Dumbo by children. David F. Sandberg shared the video on his Instagram, which has given the video an extra boost in exposure. While comparing Shazam! to Dumbo is funny, the early reactions to the DC superhero movie have not been a laughing matter. According to early reactions, DC has another hit on their hands with the comic book adaptation. David F. Sandberg is definitely happy about these early reactions and the studio must be too. It will be interesting to see how the family-friendly superhero movie ends up performing at the box office when it hits theaters early next month. If the buzz continues, DC could continue its streak of good luck in a major way. Shazam! has a lighter tone and comes across as fun for the whole family. The movie is seen as a nice contrast to all of the serious comic book movies that are dominating the box office these days. There's the Deadpool franchise, but those movies aren't exactly made for families. David F. Sandberg and Zachary Levi have brought a positive enthusiasm to the project that is evident in all of the promotional material that has been released thus far and it doesn't look like that is going to stop any time soon. It looks like Sandberg's first big studio movie is about to be a pretty big success. As the Shazam! release date approaches, expect more marketing from David F. Sandberg and Zachary Levi on social media. The movie hits theaters on April 5th, with Disney's live-action adaptation of Dumbo opening in theaters on March 29th. While Shazam! won't have to battle Captain Marvel and Avengers: Endgame, it is going to have to battle Dumbo since it hits theaters the week after. Regardless, it's all Disney, and there's going to be some Disney at the box office no matter when the movie is released. You can check out the hilarious mashup video below, thanks to David F. Sandberg's Instagram account.